If you have your hard drive partitioned and want to change the size of the partitions or the amount of partitions you have on your computer, you can. It is still going to wipe your data but if you backup your files to the main partition just while you are shrinking the other partition then you can move it all back after. You could also resort to formatting a hard drive. How to shrink a partition? In this tutorial I have 3 partitions on my hard drive. The first is C: drive, then D: drive, and finally E: drive. You can see this in the screen shot below. The first thing I am going to do is shrink E: drive. Now we must open the disk management tool in Windows Vista. I cannot guarantee this will work in Windows Vista Home and Windows XP as this was done using a higher version of Vista. Yes they could be depending on what version of Windows you are using. Be warned that I strongly suggest you backup any data or files that your partition has on it. If you leave files on there and decide to shrink the partition some versions will clearly not let you do this, while others will but we all know accidents can happen. Its always better to be safe than sorry. If I shrink a partition will the files be lost or wiped clean? If you use partition software then you can basically shrink a partition with the files on it. How to open disk management to shrink a partition? Right click on my computer or computer for Windows Vista. See more ways to open computer management. Choose manage from the menu. Then click on computer management. Choose Disk Management in the left side menu. Then you see all your drives listed in the right side. Right click on Drive E: as shown in the screenshot below. Choose Shrink Volume from the menu. Now a box will appear. It will automatically choose the size to shrink the partition by. change the size of the shrink by changing the amount in the box that is highlighted blue. When you are happy with your size press Shrink. Now see the screenshot below. My E: partition was 116mb and now it is 58.27mb. The data and files that was on there is gone. And now I have 58.17gb of free space. To use this free space we need to right click on that area and choose to create a new volume. We can also extend E: back out to 116mb by using the free space. In Windows Seven you can decrease the size of the main partition without removing files first. You are restricted by the position files. 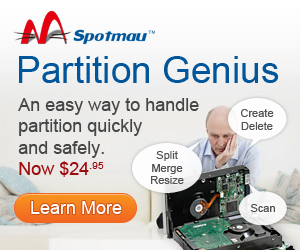 It is probably a good idea to defrag your files to place them in an organized state, ready for the partition shrink. You can shrink the existing partition from the end of the volume to create new unallocated space. Then you can label the drive and start loading it up with files. You cannot shrink C: drive unless you use another program like PartitionMagic. You can shrink any other partitions but you will still loose the files on it. I have Windows 7 Ultimate 32bit and i done a shrink and a partition format on my C: drive without any loss of data what so ever, you don’t need 3rd party software to shrink and create a partition on windows 7 it is inside windows itself, and unlike what the above says i experienced no data loss at all, sevenforums.com has tutorials on how to shrink and partition your drives, it is very basic and does not create any damage at all, do not use 3rd party software to do a job that windows 7 already does if you do then you may experience data loss from using the 3rd party software. Yes the article says “In Windows Seven you can decrease the size of the main partition without removing files first.” I also have Windows seven Ultimate but I am not sure if this works for Windows 7 home and so on. If someone has Windows vista or XP they will need 3rd party software. Nati is correct. “Shrink Volume” is not an option in either XP Home Edition, nor is it an option in XP Professional version, both of which I run. The option does exist in Vista, however the claim that existing data will definitely be lost is untrue, as John mentioned, however despite the claims that only unallocated space will be used when shrinking is also very dangerous to assume is true. If the disk is severely fragmented, data can still be lost. Defragmenting before performing this process is always a smart idea because it will minimize the risk, PLUS it will often increase the size available for creating a new volume from the unallocated space after defragmenting. No offense meant to the author, but people really need to be careful accepting the “truth” of what is said in articles like this posted on the web. Just because somebody is able to create an authoritative sounding article with “professional” looking screen captures doesn’t mean they necessarily know what they are talking about. Author may take offense to this, but the fact is a true professional would not allow comments like the above (and this one) to go unanswered for as long as these have (six months John’s comment has been here, and no reply or corrections to the article). Though this advice will most likely work without problems on Vista, it will most certainly NOT work on XP as claimed, and even on Vista, more often than not (though one should always take precautions by backing up existing data if possible), no data loss is normally experienced by using the method described. To claim your data will be lost, as if it is a given, is simply incorrect. I am offended thank you Chris! This was a simple mistake mentioning Windows XP. This is a free tutorial and the entire website has some great tips on it…All free and written by real humans who do make mistakes but I guess you are perfect. !!!! Oh no someone could not find the shrink volume link! That is terrible. At least if they did follow this tutorial they would have backed up their files. This is something I always recommend with everything just in case… I know Windows Seven and some versions of Vista will re-size with files on it but who cares…Accidents happen. Another thing is Chris..I DO NOT STOP COMMENTS THAT DO NOT SUIT ME. And when I get time… I repair any errors. Great care has been taken to give the right information on this website and I need people to let me know about errors, but when they criticize, that is not necessary. Shrink option is only avail in Vista and Win 7. Further, no data is lost (though backup is recommended just in case something goes wrong) as windows will only consider unallocated disk space for the shrinking process. Nothing is wiped out or lost in the process just like that. Windows will only handle “available disk space” meaning free disk space, in other word, shrinking is limited by the free disk space available on one partition. Do not say Windows XP, because in the Home Edition (the common version) even in the 3st service pack, there is no “Shrink” item in the menu.